I have found my ‘new vision’ since Abi died both liberating and frightening, because once you see everything your mind soaks it all up and you no longer can live in a carefree way or worry about the mundane. But the way Levi explains how this new vision is fundamental to enable us to live on after our child’s death helped me to understand what was happening, and why. I was glad that Levi didn’t try to sugar-coat his grief. As a pastor, his faith is seeped in Jesus and the promise of heaven, but this didn’t make the loss any less painful or traumatic for him. I have found religious platitudes difficult to hear – God only takes the best, God has a plan etc – but Levi’s perspective was so refreshing and immensely comforting. I have been having my own struggles with coping with my grief and feeling disconnected from my faith to a degree, but Levi writes with such clarity and belief that it felt as though my heart had been soothed. His loss was perhaps even more challenging as, just days before Christmas, his ‘busiest’ time of year when he would be celebrating the birth of Christ, he was planning his daughter’s funeral. Yet he continued to preach through Christmas and beyond and – while it wasn’t easy – he was faced with making some key decisions about how he would deal with his loss. Decisions we’ve all had to face – do we hide under the covers or do we push ourselves to do what feels unbelievably painful? His use of ‘Saturday’ as the time we are in now, was a revelation to me. That we are all in this stop gap of life until Sunday comes. This was eye-opening for me. It is indeed true that sometimes what appears to be the best times turn out to be the worst, and sometimes when we feel as though our lives are falling apart we achieve things we never thought possible – in thought, and word and deed. The book continues with Levi giving examples from his life or the Bible. Example of how we can start looking deeper into our world, opening our eyes to see what it is we truly have. He explains how he came to faith and how he found his vocation as an evangelical pastor, establishing churches and a way of preaching that spoke to thousands of people and converted many more to Christianity. I was initially nervous of this book. I find it hard to read stories of other children’s deaths other than in short blog posts. But this book isn’t about his child’s death as such, nor is it about religion. It’s about how a father turned his trauma into something that enhances his life and enables him to see life and death as the journey we are all on. He admits even in the opening section that it was not till the event that he could fully understand the reasons why people lose their minds to self-harm, drugs or alcohol after such a trauma. His empathy went off the scale! It was a comfort for me, too, when Levi described his fears that he was a failure – which I have only recently blogged about myself. It was interesting that he mentioned how watching any related TV programme – showing CPR or dramatic medical procedures – is hard for him now, as I had done in my post ‘How TV alienates the grieving’. He also makes it okay to question your faith and to feel these complex emotions, which is something I have felt over the past two years. He is very clear that the grieving parent should not stop going to church, which is an unsurprising approach seeing as he is a pastor. However, I think this is a difficult area if you don’t feel supported by your church. Though I understand that by not going to church the distance between you and God can grow wider. Levi ends the book by encouraging us all to face our fears, to push ourselves towards that which we don’t want to face. To find the strength of a lion. To look at the photos. To talk about your child. To push though the temptation to close the door to the world and hide away. Because otherwise you will surely allow grief to consume you, and you won’t be living, merely surviving. The book in general is easy to read thanks to Levi’s engaging conversational style, and I feel would comfort and enthuse readers, like it did me. While the book is based on faith in Jesus, there is much to inspire the non-believer; so if you are unsure what you believe, I would certainly recommend this book (and would be fairly certain that you would take something positive from it). ‘Through the eyes of a lion’ is available to order on Amazon. You can also listen to Levi and Jennie’s series on this book via the Fresh Life app. 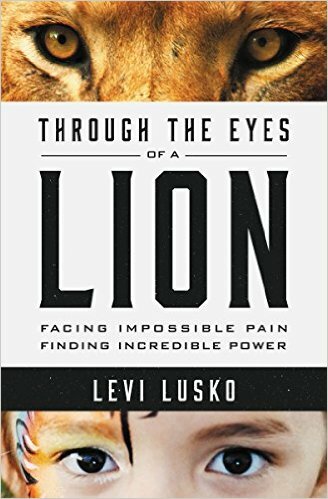 This entry was posted in Books about grief, Books about grief and dying, Faith and tagged child loss, christianity, Death, eyesofalion, faith, God, jennie lusko, levi lusko, through the eyes of a lion by Chasing Dragonflies. Bookmark the permalink. What a beautiful post! Thank you for your thoughtfulness sharing Levi, Jennie, and Lenya’s story. Thank you Steph, a remarkable and inspiring family.